MESH invites selected authors to offer original first-person statements on their new books—why and how they wrote them, and what impact they hope and expect to achieve. Meir Litvak is senior lecturer in the Department of Middle Eastern and African History at Tel Aviv University, and Esther Webman is a research fellow at the Moshe Dayan Center for Middle Eastern and African Studies and the Steven Roth Institute for the study of Contemporary Antisemitism and Racism, Tel Aviv University. Their new book is From Empathy to Denial: Arab Responses to the Holocaust. 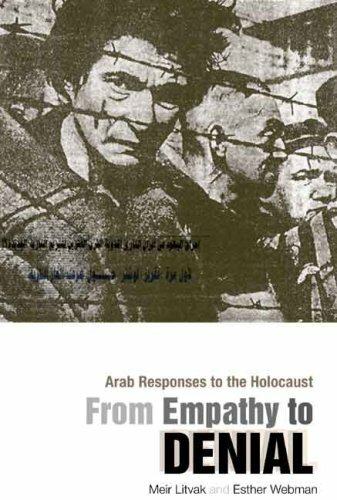 From Empathy to Denial explores patterns of continuity and change in the representation of the Holocaust in the Arab world since the end of the Second World War up to the early 21st century. It is the first scholarly, comprehensive attempt to examine and analyze the evolvement and characteristics of the Arab intellectual and public discourses on the Holocaust, and to explain the background and causes of their development. We employ a wide array of primary Arabic-language sources such as memoirs, historical texts, newspapers and internet websites, and pursue an historical approach, combined with interdisciplinary methods of discourse analysis, social psychology and Holocaust studies. However, in view of the vast scope of sources, we focus on the leading cultural and political centers that produce the discourse: Egypt, Lebanon and the Palestinian-Jordanian arena, with occasional references to other countries. The book was born when both of us, after working separately for several years on the spread of Western anti-Semitic ideas in the Muslim world, felt that the Holocaust had become a prominent issue in Arab political and intellectual discourse. Surprisingly, no serious scholarly research, aside from few casual references, had been done on this topic, so we decided to join forces. As we proceeded, we realized just how wide the subject was. References to the Holocaust are incorporated in different contexts and a wide array of publications of all Arab political and ideological trends. In addition to newspapers articles and books dealing directly with Holocaust-related issues, such as the German reparations to Israel, we often had to peruse whole books and dozens of magazine issues to find one significant relevant passage. Originally, we intended to build the book thematically, ranging from denial to justification through equation of Zionism with Nazism, the charge of Zionist-Nazi collaboration in the extermination of the Jews, and Arab perceptions of Nazi Germany. But we soon realized the need to further contextualize the thematic analysis by including studies of major cases which were instrumental in the evolution of Arab Holocaust discourse. The first one deals with the formative years of 1945-48, which presaged all the themes that have typified the discourse ever since. The second concerns the responses to the 1952 German-Israeli reparation agreement; the third analyzes the Eichmann affair in the early 1960s; the fourth deals with the Arab reactions to changing Catholic attitudes toward the Jews, prompted by the Vatican II Council. The two final chapters deal with the effect of Holocaust terminology and discourse on the Palestinian narrative of the 1948 Palestinian Nakba, and with the emergence of a new approach towards the Holocaust in the wake of the peace process in the early 1990s—an approach favoring revision of the traditional Arab perception and unequivocal acknowledgment of the suffering of the Jews. From the vast number of scattered references to the Holocaust, we had to select the most important and recurring ones, relying on our personal judgment. There is a subjective dimension in every historical study; no methodology can guarantee an entirely neutral, objective or transparent account of events. We are keenly aware of the pitfalls, as Jews and Israelis re-presenting the representation of the Holocaust in the Arab world. We have tried to maintain a dispassionate approach, enabling our sources to speak for themselves. Only in a few cases, where we thought that the lay reader might be misled by the distortion of historical evidence, have we supplemented those sources with scholarly studies that present a more accurate account of history.